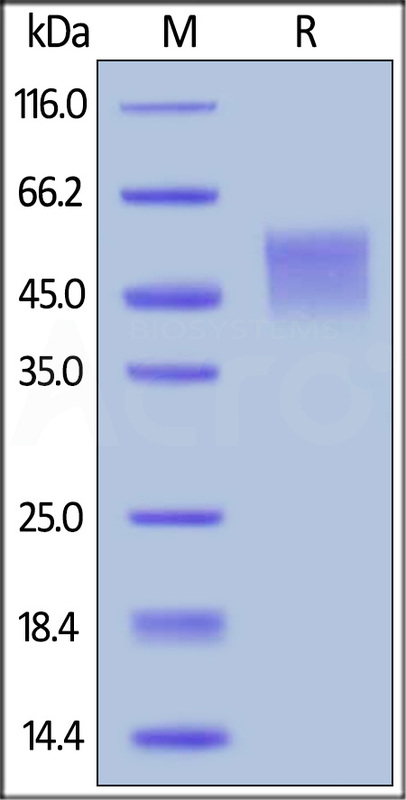 MABSol® Biotinylated Human B7-H4 (B74-H8222) is expressed from human HEK293 cells. It contains AA Phe 29 - Ala 258 (Accession # NP_078902). It is the biotinylated form of Human B7-H4 protein, His Tag (Cat. No. B74-H5222). The protein has a calculated MW of 26.1 kDa. The protein migrates as 43-60 kDa under reducing (R) condition (SDS-PAGE) due to glycosylation. The biotin to protein ratio is 3-5 as determined by the HABA assay. Biotinylated Human B7-H4, His Tag on SDS-PAGE under reducing (R) condition. The gel was stained overnight with Coomassie Blue. The purity of the protein is greater than 95%. 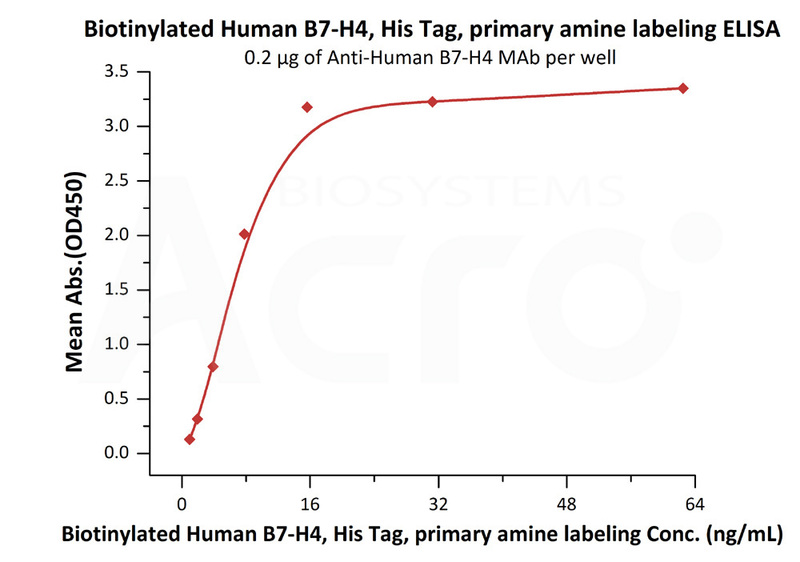 Immobilized Anti-Human B7-H4 MAb at 2 μg/mL (100 μL/well) can bind Biotinylated Human B7-H4, His Tag (Cat. No. B74-H8222) with a linear range of 1-8 ng/mL (QC tested). V-set domain-containing T-cell activation inhibitor 1 (VTCN1) is also known as Immune costimulatory protein B7-H4, Protein B7S1, T-cell costimulatory molecule B7x, B7H4, which belongs to the immunoglobulin superfamily and BTN/MOG family. VTCN1 contains two Ig-like V-type (immunoglobulin-like) domains. The expression of VTCN1 is up-regulated by IL6 and IL10 and is inhibited by GM-CSF and IL4 on antigen-presenting cells (APCs). VTCN1 / B7-H4 negatively regulates T-cell-mediated immune response by inhibiting T-cell activation, proliferation, cytokine production and development of cytotoxicity. VTCN1 involved in promoting epithelial cell transformation. (1) Salceda S., et al., 2005, Exp. Cell Res. 306:128-141. (2) Kryczek I., et al., 2006, J. Exp. Med. 203:871-881. (3) Miyatake T., et al., 2007, Gynecol. Oncol. 106:119-127.